In rare cases, a performer goes beyond the traditional one-song cover approach to cover a full set of an artist’s catalog. At their best, from Jennifer Warnes’ full album of Leonard Cohen songs to Billy Bragg and Wilco’s reinterpretation of the works of Woody Guthrie, such devoted efforts to reimagine a whole body of work go beyond mere song interpretations to cast new light on a deserving talent. We call it Double Feature Folk — a case of featuring an artist who is himself featuring another — and we start today with Bill Morrissey’s 1999 tribute to the Songs of Mississippi John Hurt. Mississippi John Hurt was one of those classic early blues artists from the days of Lomax and Leadbelly. Lost for years with but two mid-depression pressings to his name, he was tracked down in his twilight through a song reference to his hometown of Avalon, and given a few shining years in the sun — including a set at the 1963 Newport Folk Festival — as a revered elder statesman of the country blues before his death in 1966. When he released his Songs of Mississippi John Hurt in 1999, Bill Morrissey was himself an elder statesman of the Fast Folk folk scene. Morrissey had cut his teeth on the blues, finding a balance between the New York folk scene of the sixties one one side, and the early lo-lo-fi sounds of Hurt and his country contemporaries on the other. Ten Grammy nominations later, he was known for having forged a unique brand of laconic early alt-americana focused on the milltown depression that hit his native New England in the late seventies and eighties. So why a full album of Mississippi John Hurt songs? Hurt’s greatest hits were in no real danger of getting lost — this is a man whose early version of Stagger Lee is considered definitive. Instead, it seems likely that, even as folk and blues seemed to be giving way to the post-grunge and lo-fi indie movements of the late nineties, Hurt himself was starting to be forgotten. For Morrissey, who attributed his right hand work “purely” to his discovery and subsequent embrace of the blues stylings of Mississippi John Hurt, this must have been a tragedy. Here was the antithesis of the Delta blues — a man who, in Morrissey’s words, was “elegantly melodic and funny” — and all that he was remembered for was a few old chestnuts he had made his own. Reminding the growing fourth-wave folk community of its roots while pulling Hurt’s less iconic songs back together under his name seems, in this light, almost a noble ambition on Morrissey’s behalf. In celebrating those roots — the bouncy, playful blues lyric, the acoustic blues fingerplay — Morrissey redefined post-blues folk, a group which would include equally playful and lighthearted contemporaries Greg Brown and Chris Smither, just in time for a new generation of artists such as Peter Mulvey and Jeffrey Foucault. And it works, too. Morrissey’s creaky, almost anti-melodic vocal style lends itself well to the surprisingly sweet songs of this iconic sharecropper. His eclectic acoustic arrangements bring horn, harmonica, and harmony without making these songs anything but lighthearted and fun. Today, three tunes from Morrissey’s tribute to Mississippi John Hurt — plus a whole mess of covers, both by and of Morrissey and Hurt — which showcase the startling commonality of voice, perception, and style between two half-forgotten A-listers of their respective musical generations. 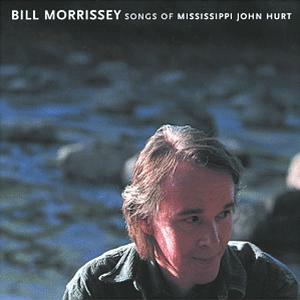 Bill Morrissey’s entire awardwinning catalog, including the fifteen-track Songs of Mississippi John Hurt, is available directly from Rounder Records. Mississippi John Hurt tracks are available on practically every good blues compilation, but all good bluesfans should have at least one copy of the Complete Studio Recordings of Mississippi John Hurt box set. Don’t forget to come back Sunday for a very special feature on up-and-coming indiefolkster Sam Amidon, including covers of Tears for Fears, some souped-up traditional americana, and more Mississippi John Hurt!